Amanda Thiele, a junior neuroscience major, knew she was interested in attending medical school. A trip to Ghana and shadowing at a local hospital confirmed that. The experience was funded by the Jennings Family Brave Companions Fund, which supports underrepresented Carnegie Mellon University students to conduct summer research. It was founded by CMU Board of Trustee member Larry Jennings. 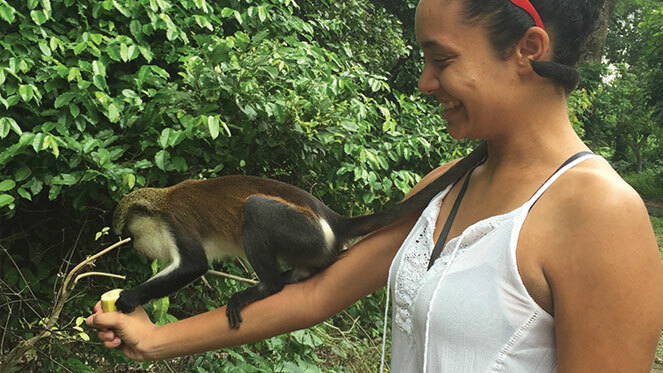 As a Jennings scholar, she spent this past summer getting medical experience and start comparative healthcare research between the United States and Ghana. Winning the Jennings scholarship gave Kaoon Ban, a senior psychology major, her first chance to travel and live away from family and friends. It was an easier transition than she thought — she traveled to Costa Rica, a place with a strong, dependent culture in its communities. She had an instant family. And an idea for her honors thesis. She began exploring the idea of communal coping, where communities take on individuals’ problems or stressors as a group effort. “Being in Costa Rica sparked the idea that wow, people in this culture are so dependent on each other. I wonder how this could relate to communal coping. This semester and next semester I’m looking into communal coping and how culture plays a role,” Ban said. One of Ban’s most formative experiences in Costa Rica was a day she got lost on a bus trip and had to use her in-progress Spanish skills to navigate. Her own experience mirrors that of the experience that inspired Jennings to launch the scholarship. While on a trip to India, Jennings and his teenage daughter, June, spent a day lost trying to visit the Taj Mahal. Jennings is a double graduate of CMU, he received his bachelor’s degree in mathematical sciences and economics in 1984 and his MBA from the Tepper School of Business in 1987. He was moved and wondered if he could give the same experience to CMU students. “Maybe there are a lot of students at Carnegie Mellon who are first-generation and/or underrepresented minorities who really want to do something overseas in the summer,” Jennings said. Jennings met with Stephanie Wallach, the assistant vice provost for undergraduate education and Ty Walton, director of the Carnegie Mellon Advising Resource Center, and the Brave Companions Fund was launched. When students return, they continue to develop their research and present at the Meeting of the Minds. “Summer is a time when there is very little financial support,” Wallach said. She added that low or unpaid internships or travel experiences may not be feasible for some people. Programs such as the ones Jennings supports helps level the playing field. Jennings supports a variety of other programming at CMU — the Summer Academy for Math and Science, a preparatory experience for high school seniors, and the Jennings Global Mathematics Scholarships, a chance for sophomores and juniors to study abroad. He also supports the Summer Undergraduate Research Fellowships for Math, and a Summer Undergraduate Research Experience for engineering students, which both provide students paid summer research. He worked with the CMU-Rwanda to establish the Innovators Forward Fellowship Fund. Pictured above is Amanda Thiele on her trip to Ghana that was supported by the Jennings Family Brave Companions Fund.